Homespun Stitchworks..... For the love of vintage: Pretty paisley's and embroidery threads! I am this morning surrounded by beautiful things (at least they are to me) I have an array of stunning vintage fabrics laid out and some stunning hand dyed shaker embroidery threads. I have to finish my stitching for the article in Pretty Nostalgic magazine (deadline tomorrow, no pressure there!) and then I am going to sort through and find just the right materials for my next project. These paisley fabrics are some of my most favourite and actually even if you cut out something quiet small you can still see a pattern in the fabric and I do believe it is one of the reasons I love it so much, that and the fact that it is normally time washed so it it is soft and slightly faded and looks so beautiful.... I am sure this love affair of mine will last all my life! I am off to my first vintage fair in February and hope to find some more there. The first Vintage Bazaar in March I have asked a couple of stall holders who I know very well now and have become friends with, to bring all the paisley they have for me to look at ..... That should keep me very busy for a while!! I have to report that my new mother of pearl embroidery scissors that I have recently bought are really really good, not only are they beautiful eye candy but they really are very sharp and the blade is pointed at the end so that it can get into little corners easily, I am thrilled with them. 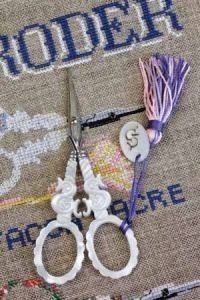 Sajou do other embroidery scissors and I think I will be getting some for a present for a friend, if you love to embroider then these are for you. They say the more you use them that they actually mould to your own fingers and hand to be very comfortable and I can quiet believe it. I have been looking at the glass bead pins on there website and I would like to get some of those as well. I think it is time to write a list for my visit in September and then go armed with oxygen so that I do not hyperventilate when I walk in the shop!! Well I am away to my stitching and whilst I do that I can keep looking at the paisley pile and the threads I have laid out, that way I can decide whilst embroidering and then be able to start straight away (I might have to have a stroke of it all first though before I put what is not needed away again!) Any fabric addicts out there like me will totally understand that last statement!! Have a great day and Happy Stitching! !